OECD Officials: Is Israel’s entry enough to ward off political adversaries? We hope it will advance clean tech and initiatives like Desertec into the Middle East. Israel is the only Middle East member. Israel’s dynamic economy, especially in science, information technology (IT) and now clean technology has propelled it to ascend to one of the world’s most prestigious world economic bodies: the Organization for Economic Cooperation and Development (the OECD) announces the organization’s own formal press release. In addition to Israel, Estonia and Slovenia are also being invited to join, which will bring the world economic body’s total country membership to 34. Considered as a “major diplomatic achievement” according to Haaretz the timing of Israel’s entry into the NGO “is what Prime Minister Benjamin Netanyahu is getting from the international community in return for starting proximity talks with the Palestinians.” But what does this mean for advancing clean tech, something Israel has become well-known for in recent years. “Unfortunate situation” or not, there is no denying that Israel’s economic miracle is tied closely with its successes in the above mentioned technologies, especially in the fields of renewable energy; and in innovative even off the wall innovative appraoches like striving to develop alternatives to the internal combustion engine. As a world leader in the field of solar energy, Israel has proven itself to be making an outstanding contribution in this very important renewable energy sector. Water too. And now, wind energy in Israel is also getting a major boost with the announcement of a major investment in a wind energy project on the Golan Heights. We hope this new “club membership” will advance clean energy projects even further. Over the years, the economies of all 31 (and now 34) OECD countries (get the list of OECD countries here) have benefited in one way or another from the transformative effects of OECD membership. Sweden, for example, undertook a drive for regulatory reform inspired by OECD work during the 1990s which helped to stimulate high rates of growth amid low unemployment and stable prices. Mexico, which joined the OECD in 1994, has confirmed its commitment to an open economy based on free market trade. Korea, which joined in 1996 following three decades of rapid growth from a starting base as a rural, undeveloped society, has become a world leader in many sectors, including ICT. 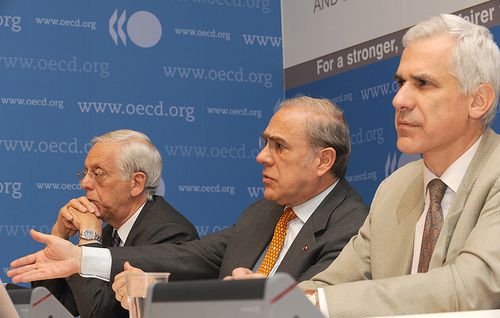 The organization also writes for the case of Israel, the only OECD country in the Middle East: The accession reviews of Israel have also been valuable for OECD countries – the OECD has learned from Israel’s experience in certain areas, such as in the policy areas of innovation and scientific and technological policy. Total civilian R&D expenditures were 4.7 % of GDP in 2007, giving Israel the highest R&D intensity in the world. It accounts for the third highest number of scientific articles per million population and has an impressive patenting performance in science and technology. Performance in certain high technology sectors, notably biotechnology, is also particularly strong. The Paris based NGO will formally induct Israel and the other two countries into its membership in a formal ceremony of the OECD Ministerial Council on May 27, later this month. Click here for stats and profile on Israel.